The Belkin Thunderbolt Dock adds a selection of extra ports to Thunderbolt-equipped Macs. It costs a lot especially once the Thunderbolt cable is added, but it has three USB3 ports compared to just one on Matrox DS1 Thunderbolt dock. However, their speed is capped at 2.5Gbps, just like the Matrox's. Not a problem with hard drives since they operate well below this ceiling - our test drive worked as well through the dock as with a modern Mac - but you won't get the most out of high-performance SSDs. Our test SSD reads sequentially in excess of 400MB/sec when connected to a Mac. It failed to surpass 200MB/sec through the dock, averaging 170MB/sec. Random read speeds averaged just under 100MB/sec. While better than USB2, it's a disappointing drop from 170MB/sec with a Mac with USB3 built in. 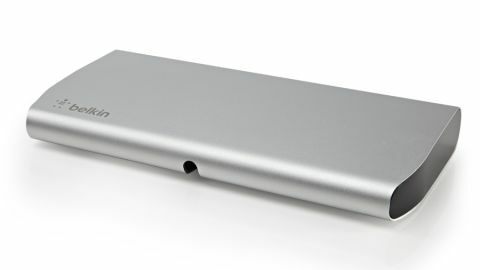 The dock also provides FireWire 800 (missing from Matrox's dock), Gigabit Ethernet and audio input and output mini-jacks, all on the back side. A channel on the dock's underside allows a cable to run to the front and be held in place, allowing portable storage to be quickly connected. Sheer convenience goes some way to justifying the expense if you'll use the dock with a MacBook. You only have to connect one cable when you return to your desk in order to use speakers, storage and other devices left attached to the dock. That includes an extra display, if you use a Mini DisplayPort to attach one to a Thunderbolt port. As for Thunderbolt cables, Apple sells one that's 0.5m long (£25), which is a better choice than longer alternatives.